Goya Foods launches the ‘Can Do’ campaign, a yearlong series of consumer product promotions and food donations to benefit Feeding America and local food banks. 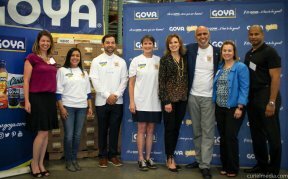 A minimum of 600,000 pounds of Goya products will be donated to families and individuals throughout the United States who lack access to nutritious, affordable and culturally appropriate meals. And, in the Chicago-area, Goya will donate 40,000 pounds of food products to Northern Illinois Food Bank. “We have always believed in the importance of helping families in need,” said Bob Unanue, President of Goya Foods. “Since my grandfather started Goya in 1936, we have worked hard to demonstrate the values we hold true to the foundation of Goya Foods and what better way to give back to our country than with the nourishment of a healthy meal.” The ‘Can Do’ campaign is Goya’s way to give back to the community and provide consumers with the opportunity to be a part of Goya and Feeding America’s fight to end hunger in the United States. 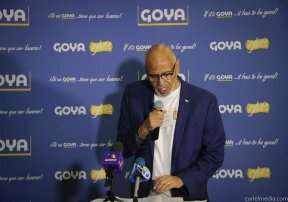 Each donation will be made in the name of Goya’s retail partners throughout the country, which will also give supermarkets the opportunity to be part of this new initiative. The ‘Can Do’ campaign is part of Goya Gives, a national initiative committed to supporting local communities through social and environmental causes. The ‘Can Do’ campaign kicked off June 1, 2017 and will end May 31, 2018. For details on this donation, please visit www.goya.com/goyagives. This Wednesday, June 28, Goya Foods delivered 40,000 pounds of food products to Northern Illinois Food Bank (NIFB) as part of the “Can Do” campaign launch to benefit Feeding America (FA) and local food banks. This local donation in the Chicago land area is part of the 600,000 pounds of products that Goya will donate to families and individuals in need throughout the United States. In this way, Goya responds to the sad reality that there are 42 million people in the United States who go hungry because they do not have access to affordable nutritious food. Pictured from left to right Tracy Galindo(Jewel-Osco), Karina Sosa (Goya Foods), Daniel Devir (Goya Foods), Kitty Finn (FA), Julie Yurko (NIFB), Rafael Toro (Goya Foods), Melissa Hill (Jewel-Osco) and Ian Hunter (FA).